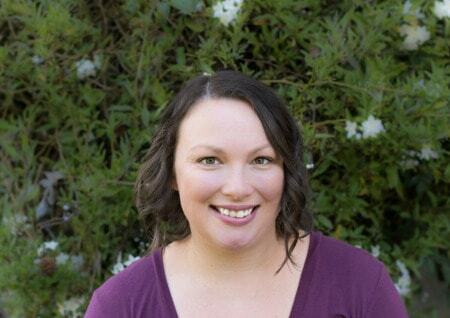 April 2, 2018 By Aileen 2 Comments This post contains affiliate links. As an Amazon Associate and member of other affiliate programs, I earn from qualifying purchases. Sponsored Post: This post for Red Wine Sangria is sponsored by Grocery Outlet, but the content and opinions expressed here are my own. The following content is for readers 21+. 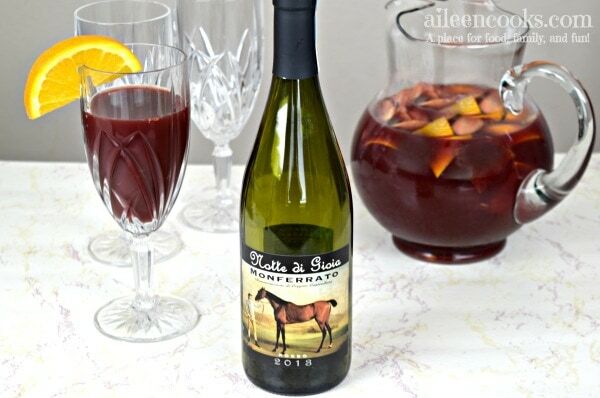 Learn how to make an easy red wine sangria with Spanish wine and peach liquor. This recipe has just 4 ingredients and mixes up quickly and tastes delicious on those warm nights that will be here so soon. I love a good sangria. It goes down easily and is great for enjoying with a friend. If you have been curious how to make your own sangria at home, then this post is for you! 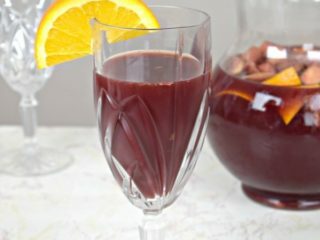 To make sangria, you will want to start with a couple of affordable bottles of medium-bodied red wine. Lucky for me, I stocked up at the Grocery Outlet wine sale and scored two of these bottles of Spanish wine for $3.99 each. They had so many great deals, I’m so happy I made it to the sale! Pour both bottles of wine into a pitcher and mix in your choice of brandy or liquor. I used peach liquor. It added a nice sweetness and extra layer of flavor. Next, add in chopped up fruit. One citrus and one non-citrus. I used oranges and apples, but you could switch it up with lemon and peach if you like. Finally, refrigerate your homemade sangria for at least 4 hours. Overnight is even better. It gives it time for everything to blend together. Enjoy chilled over ice or mixed with bubbly lemon-lime soda. An easy recipe for red wine sangria with just 4 ingredients. Combine all ingredients in a pitcher and mix. Refrigerate a minimum of 4 hours. Serve sangria cold. Refrigerate any leftovers. 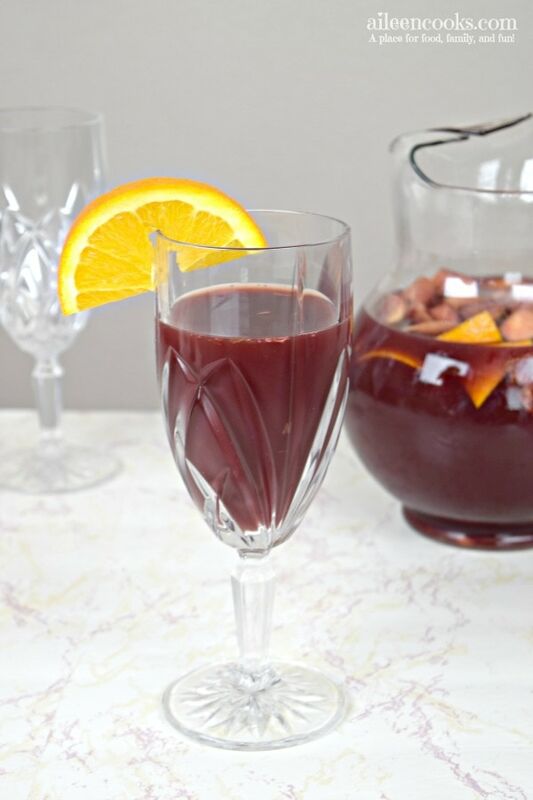 Did you try this recipe for red wine sangria? Let us know what you thought in the comments or tag us on social media using @aileencooks. Previous Post: « Meet Chef Stuart O’Keeffe in San Francisco! Oh, I love a good sangria recipe. This looks so easy! 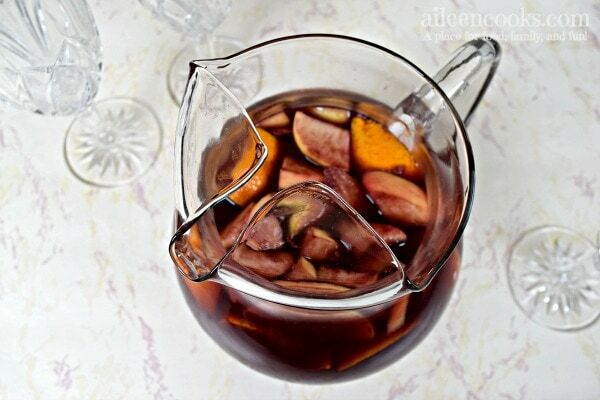 I LOVE wine but have never made sangria before! I’m definitely going to be making this recipe a lot this summer!